(Englewood, New Jersey; March 19, 2018) – The New Jersey Association of Verismo Opera's Artistic Director, opera luminary Lucine Amara, announces the cast performing its debut of Giacomo Puccini's last opera, Turandot. Verismo Opera, the Bergen Performing Arts Center's (bergenPAC) house opera company, presents this dramatic opera set in ancient China on Sunday, April 22, 2018. The performance begins at 3:00 p.m. at the theatre, located at 30 North Van Brunt Street, in Englewood, New Jersey. Previously, Verismo Opera performed act three in concerts in 1997 and in 2009. Verismo Opera's spectacular production will thrill the audience. “This great but difficult opera is the most audacious opera the New Jersey Association of Verismo Opera has attempted. Musically and visually, we have pulled out all the stops on this one! Be prepared to be amazed!" said Amara, who performed the roles of Turandot and Liu several times throughout her long career at The Metropolitan Opera. Amara announced the cast of artists performing in this dramatic production. 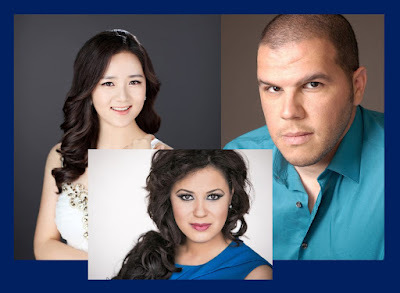 Soprano Zhanna Alkhazova (Center photo) debuts with the company as the ice princess Turandot. Recent engagements include Donna Elvira in Don Giovanni with Geneva Opera, Leonora in Il Trovatore with Roman Borgman Opera and Tamara in Rubinstein’s The Demon with Commonwealth Lyric Opera. Her operatic credits include the title roles in Tosca and Aida, Elisabetta in Don Carlo, Micaela in Carmen, and Nedda in Pagliacci, among others. Alkhazova was the first place winner in the New Jersey Association of Verismo Opera's 2016 Annual International Vocal Competition and the cover of Aida in its 2017 production. Tenor Philip Alongi (Top right) performs the role of Prince Calaf, Turandot's suitor, who must solve her riddles or die. Opera lovers and newcomers will recognize and respond to Alongi's moving performance of Calaf's famous aria "Nessum dorma". Notably, this New Jersey native received praise from the Miami Herald for his “clarion top notes and striking physicality.” Alongi performed throughout the United States in leading roles, including Cavalleria Rusticana’s Turiddu, Carmen’s Don Jose, and others. Previously, he performed with Verismo Opera in Tosca (Cavardossi) and Madama Butterfly (Pinkerton). Alongi sang at Tim Russert’s funeral and the televised memorial service at the Kennedy Center. His credits include six live televised performances, with two on the TODAY show. Korean-Chinese soprano Yulan Piao (Top left) debuts with Verismo Opera to perform the love torn, tortured Liu. She received first prize in the New Jersey Association of Verismo Opera's 2017 Annual International Vocal Competition and the Vienna Summer Music Festival Competition. Piao made her professional debut singing Rigoletto’s Gilda in South Korea. The stellar cast includes a range of singers debuting and returning to Verismo Opera's stage. Singers making their first appearance with the company are tenors Tai Collins (Pang) and Hao Hu (Pong). Bass-baritone Roland Burks (Timur), baritone Fredrick Redd (Ping), baritone Jonathan Green (Mandarin), and tenor Giovanni Simone (Emperor) join the company again to perform in this stunning production. Verismo Opera presents this 18th century dramatic fairy tale by Venetian playwright Carlo Gozzi in three acts, with the libretto by Giuseppe Adami and Renato Simoni. In Puccini's extravagant portrayal of both ancient China and the opera's namesake Princess, Turandot, the musical genius masterly shows how true love can conquer sacrifice, hate, and vengeance and ultimately, melt an ice cold heart. Under Principal Conductor/Music Director Lucy Arner, a live orchestra accompanies the performance, with Chorus Director/Associate Conductor Michael Wittenburg leading the Verismo Opera Chorus. General Manager/Stage Director Evelyn La Quaif directs the fully staged opera. The cast appears in period costumes and performs in Italian. English supertitles are projected on a screen for the audience to follow. The theatre is handicapped accessible. Designated handicapped parking spaces are available. For information about bergenPAC's Accessibility Services, contact the theatre's Americans With Disabilities Coordinator at (201) 816-8160, extension 31.